Yours truly caught three probloggers getting in the Christmas spirit. 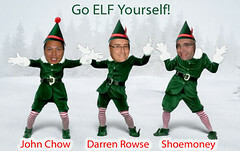 Watch the video to see them decked out as elves while they shake their moneymakers to a Holiday jingle. I really thought about stuffing an affiliate cookie for OfficeMax, but I resisted the temptation. You will see what I mean if you make a video. I sent them all an email, so we’ll see. Darren Rowse responded and said he had already seen his head on about three of these things :). It’s a pretty funny little video. I get a kick out of watching it. Post a linkback here if you make one for yourself.